Military tribunals for some of the hundreds of men detained at the US base on Guantanamo Bay moved a step closer last month with the appointment of a chief prosecutor and chief defence counsel. But defence officials stress that everything remains on the drawing board until orders are issued by the president. "We have a number of plans that we work for short-term and long-term strategies but that's all they are - plans," camp commander Major-General Geoffrey Miller told the Associated Press news agency. Renovation work such as rewiring has begun on a number of buildings which could later be designated as courts for the tribunals. "We're getting ready so we won't be starting from scratch," he said. 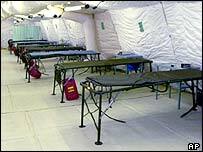 The detainees held at Camp Delta on the isolated US base include about 680 people captured during the war against the Taleban in Afghanistan, launched by the US after the 11 September 2001 attacks. All have been classified as "enemy combatants" and as such are not entitled to legal representation or a civil trial. None have yet been charged though cases are being prepared against 10 or more detainees. 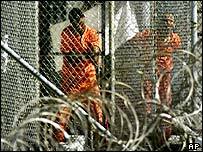 After the detention centre opened in January 2002, US Defence Secretary Donald Rumsfeld called its inmates "among the most dangerous, best trained, vicious killers on the face of the Earth". But many are now thought to be low-level fighters. Human rights groups have criticised both the makeshift conditions at the prison camp and the lack of rights afforded to the detainees.